When somebody says “old-growth forest,” what do you imagine? Monumental boles of coast redwood or Douglas-fir or Sitka spruce rising in rainforest gloom over head-high beds of sword fern? The supersized-broccoli profiles of giant sequoias backed by High Sierra crests? Those are certainly some of the classic American examples of ancient forest, but there are plenty of other versions—many quite different than those sylvan cathedrals. “Old growth” isn’t an exact label, and the term can mean different things to different people, with various shades of meaning depending in the plant community, too. Notice that’s “plant,” not “tree” specifically: There is even old-growth sagebrush and bitterbrush steppe, and old-growth California chaparral supporting downright monstrous manzanita. And tree species shorter lived than, say, oaks or Douglas firs can form their own plenty impressive version of old-growth stands: Cottonwoods, for example, may live only one or two centuries, but are so fast-growing that a riparian forest of that vintage—with titanic, deeply ridged trunks and skyscraping canopies—can be as awe-inspiring as a 1,000-year-old conifer grove. Furthermore, many old-growth trees aren’t giants. Rangy eastern arborvitae scrawled across cliff faces in Ontario and the U.S. upper Midwest may be 1,000 years old or more. Ancient mesquite savanna or pinyon-juniper scrub or South Florida mangrove swamp doesn’t look much like the towering old growth of the Pacific Northwest or Southern Appalachian coves, but it can be just as venerable. Old-age characteristics vary from species to species, but even in small-statured ancient stands, you’re likely to see some fantastically misshapen, mystical-looking trees. Here are some awesome old-growth hikes from across the Lower 48, chosen mostly to offer up a sense of the variety and spread of ancient forests in the country, from classic, “big-tree” old growth to stunted, scraggly woods. Wherever you go, you’ll feel as if you’ve stepped back in time while exploring the magical world of these hardy, full-of-character trees—oldies but goodies, indeed. The squat hollies, some of which are on the order of 300 years old, share their dominion here with sassafras and shadbush. Blackgum marks the Sunken Forest’s sodden spots, while scattered pitch pine, black oak, and juniper represent fading relics from an earlier plant community now mostly replaced by climax holly forest. The dearth of holly snags suggests the centuries-old trees standing represent the pioneering front guard of the Sunken Forest’s holly community, the next generation of which is threatened by heavy deer browsing. As striking as the gnarled trees of this ethereal, low-slung wood is its heavy load of lianas: poison-ivy, Virginia creeper, greenbrier, wild grape. Given that vine drapery, it’s a good thing the trail through the Sunken Forest proceeds by elevated boardwalk. 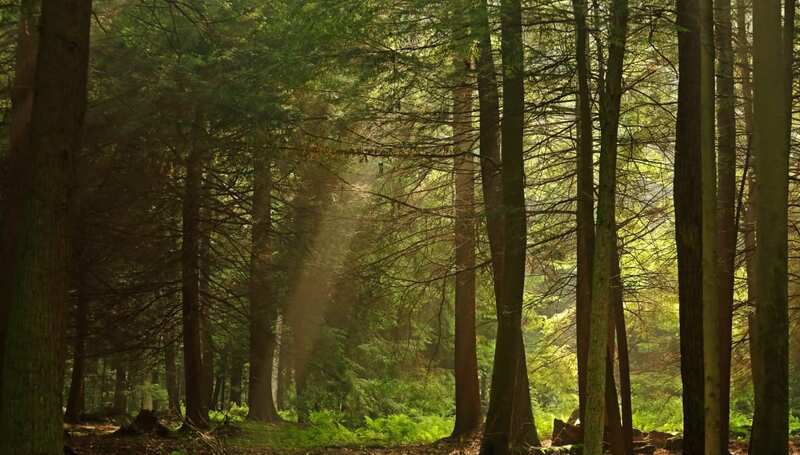 A superlative example of primeval white pine/hemlock/northern hardwood forest, the 1,500-acre old-growth portion of Cook Forest State Park constitutes the loftiest canopy in the Northeast. This remnant of the Allegheny’s pre-settlement “Black Forest,” protected with great foresight in the late 1920s, includes 60-plus eastern white pines soaring in excess of 150 feet, including the 181-foot Longfellow Pine, the tallest tree in the East north of the Great Smoky Mountains. Many eastern hemlocks as well as red maples, northern red oaks, American beeches, and other hardwoods stretch past 100 feet here. The 1.2-mile Longfellow Trail in the park’s Forest Cathedral Natural Area leads past the Longfellow Pine and many other tremendous white pines; the 0.9-mile Seneca Trail, meanwhile, accesses champion hemlocks, including an 145-foot specimen taller than any other in the Northeast. Along with the Boundary Waters of northeastern Minnesota and the Adirondacks of New York, the Great Smoky Mountains are among the great bastions of old growth in the eastern United States. And because these virgin remnants lie in one of the richest temperate-forest zones in the world, they’re all the more sublime. Old-growth discoveries in the rugged Great Smokies backcountry continue to be made—a nearly 192-foot tuliptree identified only a few years ago is the current record-holder for the country’s tallest broadleaf tree—but quite a few representatively awesome stands are easily accessible. The Albright Grove in the park’s northeast is one of these: virgin cove-hardwood forest once owned by the Champion Lumber Company and sold to the Park Service before being logged. The Albright Grove Loop, accessed about three miles down the Maddron Bald Trail, wanders amid grand tuliptrees (including a hulk 135 feet high and a bit more than 25 feet in circumference), eastern hemlocks, sugar maples, Frasier magnolias, silverbells, and beeches. South Florida’s Big Cypress is so-named not for the heft of its trees but for the extent of its semitropical wilderness: the huge bald-cypresses were mostly logged out of the Fakahatchee Strand, Gator Hook Strand, and its other mesmerizing forested sloughs. At the Corkscrew Swamp, however—reached at the far northwestern edge of the Big Cypress, though not part of Big Cypress National Preserve—you can get a sense for what the region’s primeval bald-cypress swamps looked like. 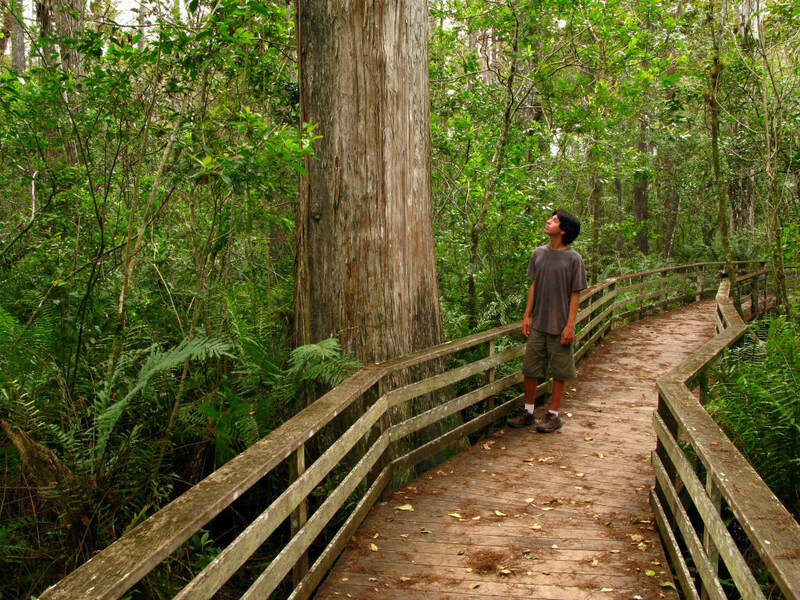 Walk the 2.5-mile boardwalk through Audubon’s Corkscrew Swamp Sanctuary, and you’ll experience the East’s closest analogue to the cathedral stands of redwood or western redcedar in the Northwest. As with most trees, ancient bald-cypresses don’t closely resemble their younger, spindlier brethren. Instead, these Corkscrew giants, some of them 130 feet tall, have barrel trunks up to 25 feet across and wild, eccentric crowns, looking almost like tropical hardwoods. Lake Okeechobee, the biggest lake in the Southeast and the signal feature of the Everglades headwaters, remains impressively vast, and large stretches of its shores feel remote enough to summon the old wilderness tempo of the ‘Glades. It is also, however, heavily manipulated—and has been since the early 20th century, when canals and levees labored to divert and control its waters, and ward against the devastating overflows hurricanes historically wrought. Among the more significant man-made alterations was the construction of the Hoover Dike, the main impetus for which was a 1928 hurricane that unleashed the Great Okeechobee Flood that killed some 2,500 people. One of the few places where you can experience Lake O’s pre-dike shoreline is along the six-mile Rafael Sanchez Trail north of Port Mayaca, which traces the Okeechobee Ridge in a narrow strip of jungle between Highway 441 to the west and sugarcane fields eastward. This is an old-growth hardwood hammock dominated by colossal live oaks, bald-cypresses, and strangler figs (the U.S.’s “banyan”) looming amid heavy fronds of cabbage palms. Incidentally, this lake-ridge hammock lies within easy reach of another precious nugget of Okeechobee old growth: Barley Barber Swamp, a holdover of the region’s primeval bald-cypress stands. Some of the country’s most significant ancient forest lies in the subalpine zone of the American West, where wet, high woods may go long intervals between stand-replacement wildfires, and where obstacles of terrain and remoteness often discourage timber harvest. The Never Summer Mountains along the Colorado Front Range intercept quite a bit of moisture, and their relatively high precipitation helps explain the impressive magnitude of the trees in the old-growth spruce-fir forests of Bowen Gulch above 10,000 feet. Escaping the fate of being logged in the late 1980s, these stands—which include conifers as old as 600 years old and as broad as four feet across—gained protection through an expansion of the Never Summer Wilderness. 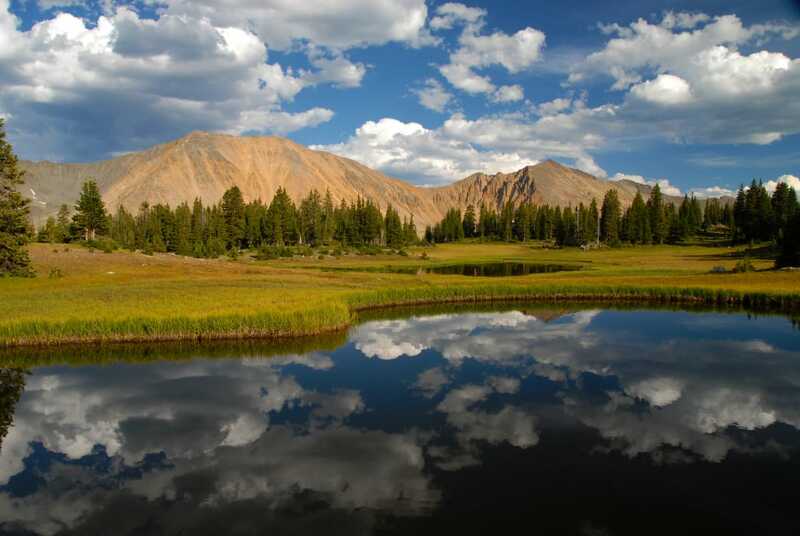 Trending south and southeasterly from Bowen Pass to open at the Kawuneeche Valley in Rocky Mountain National Park, Bowen Gulch lies in the southern portion of the wilderness. 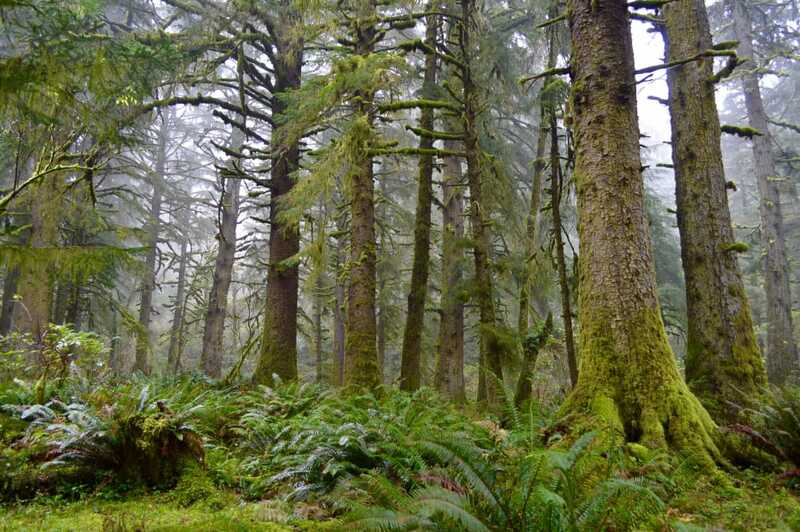 The 5-mile Bowen Gulch Trail exudes a feel of the ancient spruce-fir stands. Some of the least-appreciated but most significant old growth in the country falls in the Cross Timbers, a southerly portion of the great North American transition belt between eastern forests and Great Plains grassland. These hardscrabble woodlands and savannas of post and blackjack oak, typically only about 15 to 40 feet tall, stretch from southeastern Kansas through Oklahoma to eastern Texas. The stubby, knotty oaks don’t produce commercially valuable timber, and particularly in rough and rocky reaches unsuitable for cultivation much virgin Cross Timbers acreage remains. Oklahoma’s Keystone Ancient Forest Preserve serves as one of the standout protected areas of old-growth Cross-Timbers. Encompassing a wooded upland cut by ravines draining to the Keystone Reservoir of the Arkansas River, this sanctuary includes crooked-armed post oaks 300 to 400 years old as well as eastern junipers—a long-lived conifer that commonly grows along Cross Timbers escarpments or in glades—that have stood as long as half a millennium. The City of Sand Springs, which owns the land, opens the preserve to hikers on select days. Meanwhile, you can learn more about Cross Timbers old growth from the Ancient Cross Timbers Consortium, which helped identify and safeguard the Keystone tract. One of the defining swaths of Beaver State old-growth—distinct from better-known temperate-rainforest groves west of the Cascade crest—lies in the lava outback southeast of Bend: the Oregon Badlands Wilderness, a kingdom of mighty old western juniper arrayed upon the exceedingly subtle mantle of the Badlands shield volcano. The high lava plains of Central Oregon, carpeted in Mazama and Newberry ash and pumice, are perhaps the greatest stronghold of this stringy-bark conifer. Rangy, fat-trunked junipers some 1,000 years old or more grow here amid a corrugated landscape of basaltic pressure ridges and dusty washes. A hike along the Flatiron and Ancient Juniper trails shows off plenty of great savanna veterans and their standing- and fallen-dead kin—plus the craggy rampart of Flatiron Rock, one of the few expressions of high relief in this subdued, scrubby country. Technically speaking, it doesn’t get more old growth than this 4.5-mile timberline hike in the Inyo National Forest’s Ancient Bristlecone Pine Forest at some 10,000 feet in California’s White Mountains, the arid alpine range across the Owens Valley from the Sierra Nevada. In a 1958 National Geographic article, Dr. Edmund Schulman revealed to the world what he and his University of Arizona Laboratory of Tree-Ring Research had found here: numerous Great Basin bristlecone pines in excess of 4,000 years old, including one—Methuselah—that had stood for nearly 4,800 years, making it at the time the world’s oldest-known living tree. 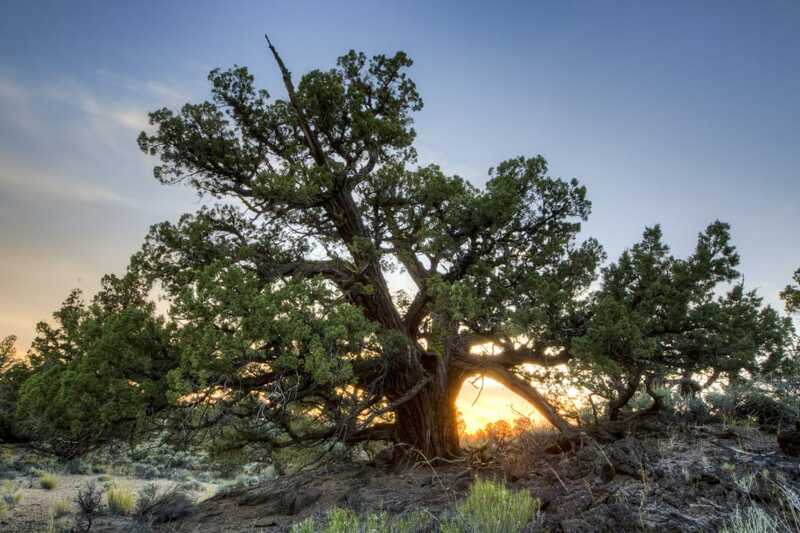 The unlabeled (for its own protection) Methuselah still stands—now close to 4,790 years old—amid the Schulman Grove’s gnarled hulks, although just a few years ago another bristlecone in the vicinity was confirmed to be hoarier yet: more than 5,060 years old. 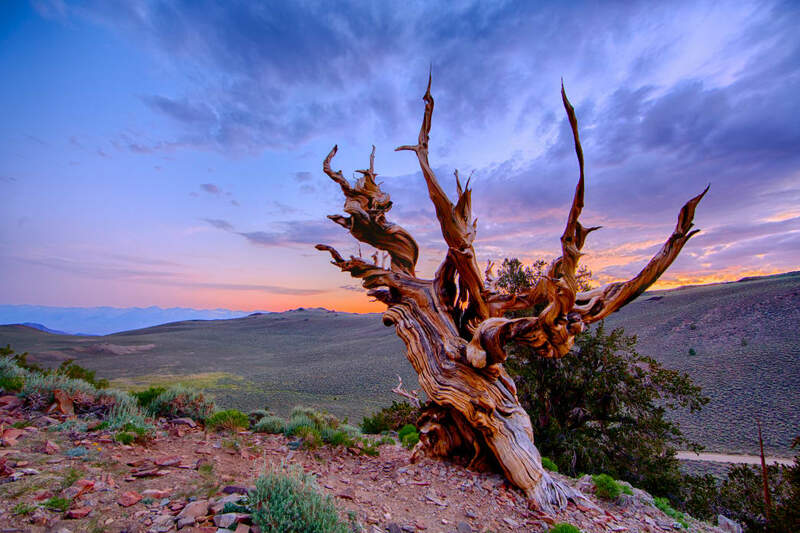 We don’t fully understand the exact mechanism for the Great Basin bristlecone’s superlative longevity, although we know the longest-lived exist on the harshest sites, and that they can maintain a slim stripe of living cambium amid a scaffold of mostly dead wood. The Methuselah, which is unlabeled for its own protection, is believed to be about 4,790 years old. It’s remarkable to look upon one of these bulky, twisted sentinels of “living driftwood”, as they’ve been called, and consider when they seeded up here among the White Mountain dolomite; and to consider the antiquity of the naked bristlecone snags, which may stand for hundreds of years after the tree has died, and the litter of logs amid the mountain rubble, the bones of pines dead perhaps for thousands of years. Western redcedar (giant arborvitae) is not only one of the world’s heftiest trees, it’s also among the most gloriously mythic-looking in old age—buttressed, burled, and almost unbelievably rotund. 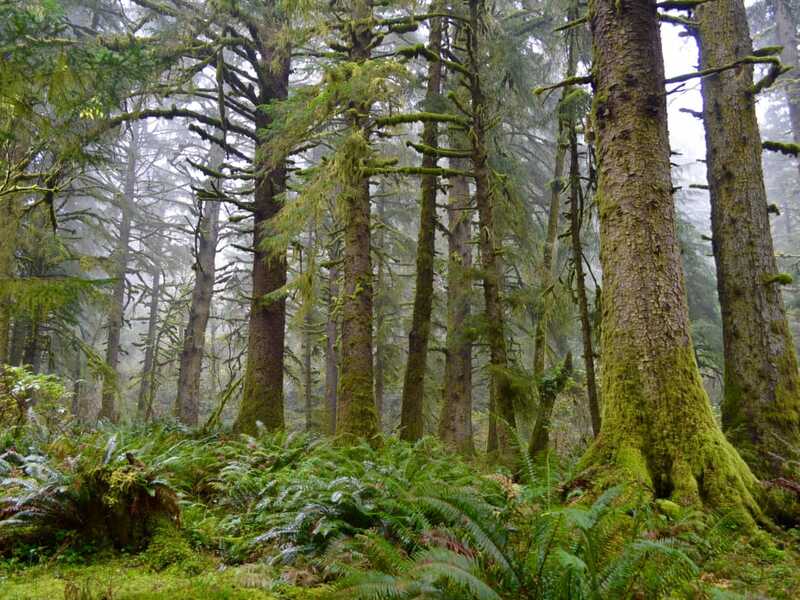 The largest-known redcedars inhabit the Olympic Peninsula and Vancouver Island, but other magnificent groves are scattered throughout the Northwest’s swamps, hollows, and alluvial benches—from the (awesomely named) Big Bottom in Oregon’s Clackamas drainage to the giants of Long Island in southwestern Washington’s Willapa Bay. In terms of extent and stature, one of the most significant stands of virgin redcedar lies on the glacially leveled floor of the Big Beaver Valley in the North Cascades. You can reach them via North Cascades National Park’s roughly 25-mile-long Big Beaver Trail, commenced on foot at Ross Dam or reached by boat at Big Beaver Landing. Along with the enormous redcedars—saved from drowning in 1983 after a successful campaign against a proposed raising of Ross Lake’s levels—the Big Beaver Valley does indeed boast plenty of swampy beaver backwaters. Five Ponds Wilderness—Adirondacks, New York: One of the biggest (and wildest) unlogged tracts in the East—and a place to experience an old-growth forest’s ample deadfall, thanks to extensive blowdown from a notorious 1995 derecho (windstorm). Itasca Wilderness Sanctuary—Lake Itasca, Minnesota: The Sanctuary’s centuries-old white and red pines suggest the one-time stature of the Upper Midwest’s great North Woods. Boardwalk Loop Trail—Congaree National Park, South Carolina: Congaree protects one of the greatest remaining old-growth bottomland forests in the Southeast, and one of the tallest hardwood canopies in the world. Mahogany Hammock—Everglades National Park, Florida: A boardwalk through an unlogged tropical hardwood hammock amid Everglades sawgrass that passes a behemoth West Indian mahogany. Hoh Rainforest—Olympic National Park, Washington: The epitome of Pacific Northwest spruce-hemlock rainforest in all its mossy old-growth glory. James Irvine Trail—Prairie Creek Redwoods State Park, California: Gargantuan coast redwoods, the fairytale rainforest oasis of Fern Canyon, plus Golf Bluffs Beach to boot—astonishing. South Grove, Calaveras Big Trees State Park—Sierra Nevada, California: Provides an easily accessible introduction to the almost unrivaled dimensions and diversity of Sierra mixed-conifer forests—not just giant sequoias, but also enormous sugar pines, which are the largest pines in the world. Bear Wallow Wilderness—Mogollon Rim, Arizona: Scorched in 2011 by the biggest wildfire in Arizona’s history, the Bear Wallow Wilderness still showcases fine groves of old-growth ponderosa pine.